While unassuming in its nature, the bashful potato has a lot to boast about. Did you know that the average person can subside off nothing but potatoes and butter alone for extended periods of time? 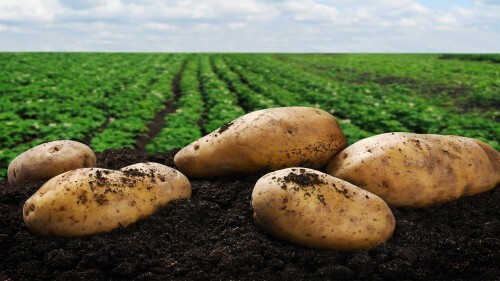 With only 110 calories, no fat, no cholesterol, no salt, 45% of the daily value of Vitamin C, more potassium than a banana, a good source of Vitamin B-6, being high in fiber and containing large amounts of antioxidants; there is a lot to know about the nutritional properties of the potato. Through many studies conducted by the United States Potato board, it has been proven that potatoes can help promote your cardiovascular health, maintain lean body mass and boost the body’s immune system. 110 Calories- One medium potato has only 110 total calories. Fat Free- All potatoes are naturally fat-free. No saturated fat or trans-fat of any kind. Sodium Free- Potatoes do not contain salt. Vitamin B-6- Potatoes are a good source of Vitamin B-6, they contain .2mg which is 10% of the recommended daily value. Vitamin B-6 helps carbohydrate and protein metabolism, makes amino acids for body proteins and is a cofactor for enzymes involved in energy metabolism and red blood cell production. Fiber- Potatoes contain 2g of Fiber, which is 8% of the recommended daily value. Dietary Fiber is a complex carbohydrate that cannot be digested or absorbed in the intestines. Dietary Fiber promotes blood lipid levels, which regulate blood glucose and increases satiety, which can help with weight loss. There are many myths about carbohydrates that lead people away from potatoes. Contrary to popular belief, when eaten in normal amounts, potatoes DO NOT cause you to gain weight or become obese, nor do they cause diabetes or contribute to blood sugar spikes and valleys. Carbohydrates are the preferred food source for your brain and muscles. When severely cut out of your diet your body starts breaking down the tissues in your heart and vital organs to produce their own carbs. Potatoes contain 25g of carbohydrates, which is less than 10% of the recommended daily value.